Applied within an automotive interior application, this ash cup is injection molded from a thermoset phenolic material – Plenco 06301 – due to the thermoset material’s heat resistant properties and surface finish quality. The ash cup is fabricated from a 6-Cavity tool in one of Woodland Plastics’ 500-ton thermoset injection molding machines. The final part includes secondary operations of deflashing and painting, along with assembly of a spring and lid, before being shipped to a customer plant in Mexico. 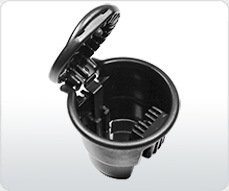 Product Description This custom injection molded ashtray cup and lid is used within an automotive interior.